I'm getting ready to build a 2-node Oracle 11gR2 RAC database on VirtualBox. This will be another test of what I consider to be the best desktop virtualization software. 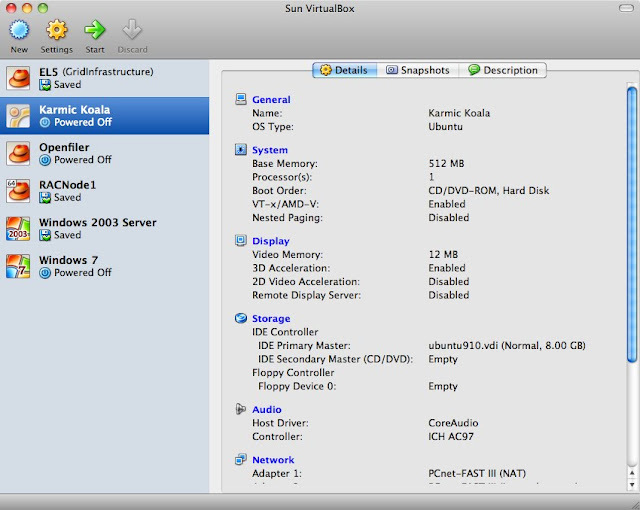 Right now I'm running VirtualBox 3.1 on MacOSX 10.6.2 host with 6 guests. For running RAC however, I've discovered that 11gR2 is a memory hog. So my puny 4GB of RAM on my intel core duo iMac isn't going to cut it. Started the preliminary installation of OEL5 for the first node and Openfiler for iSCSI but will have to wait for the memory for the serious work to begin. I'll be following some useful guides out there for similar setups on VMWare, Solaris and Oracle VM. Haven't found any for VirtualBox implementations yet so this should be a pretty exciting experiment.